and remove them from the game. Why dont I like this card? I run an Exodia deck. magician of faith or mask of darkness. from the game back into play. Scott Gerhardt Removing cards from the grave is always nice. Not really main deck matierial, but bring it in from the side against decks utilizing cards like Monster Reborn and Magician of Faith. It's decent. Soul Release allows you to take up to 5 cards in your opponent's Graveyard and remove them from the game. The best use to this is for countering Magician of Faith. As we all know Magician of Faith can be a very annoying mid to late game card. Being able to stop them from reusing Swords of Revealing Light, Dark Hole, Pot of Greed, ect. can help keep the game in your favor. Another good use for Soul Release is stop Exodia from being ressurected via Hane-Hane and Monster Reborn. I've seen an Exodia player recover three parts of Exodia from his Graveyard with that combo. A timely played Soul Release will stop Exodia dead in its tracks. 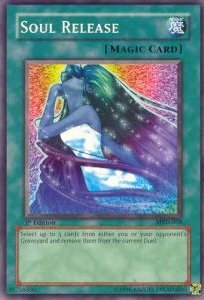 IMO this card is best kept in the Side Deck. Even though it can help you out versus Magician of Faith, it still won't always win you the game. Against Exodia, it will definitely change their plans unless they counter it. I reccomend keeping atleast one in your Side Deck. them from the current Duel. card ownage, would have been if it was a Quick Play Magic or Trap Card. out and it totally screws up their combo. if you have room. Expect to card to see some play. This card stops Magician of Faith and Monster Reborn in their tracks. Remove that ugly Raigeki, Pot of Greed, or Summoned Skull before they can save them from the graveyard. 5 cards is a lot to get rid of. I've had this card used against me sometimes, and it wasn't pretty. Also, gives Shadow Ghoul a 500 point deduction (although Reverse Trap can drop it further). If you play a discard deck, you may want to put one or two of these in. Currently, there is no way to bring back cards removed from the game. Enjoy. It has potential, and can be game-breaking, but it's very situational. Tech one into a beatdown and see if it can't save you the game. try to use their discard pile to set up. cards. No more Change of Heart, Pot of Greed or anything like that for him.